Super Sinus Juice Recipe: Juicing for Health Series. I Love Ginger Juice. Ginger is one ingredient that you can't squeeze in a citrus press, and you can't really blend it. (OK, it's possible to blend raw ginger, but it can get a bit mealy in texture). Raw ginger is best when juiced with a blend of fresh fruit/veggie juices. Thus, you will need some sort of juicing appliance to get this ginger juice kick. No Juicer?? Ginger Craving Tip: If you are desperate and want some ginger without a juicer - try grating fresh ginger into a blender and blending it with fresh juice and coconut water ice or light smoothie ingredients. A good tsp-Tbsp of ginger will do it. Another good option for your sinuses is inhaling hot ginger tea. Add a pouch of some fresh grated ginger to hot water and sweeten it to taste. Ginger tea bags are an even easier option (though I haven't tried this method). Loving Your Ginger Buzz. That warming flavor wiggles on your tongue, then down your throat and up through your nose. It hums and sizzles for a few seconds before melting away into a warm soothing steam of spice. And then you want more, take another sip, and it starts again. Real, Fresh Ginger is stimulating, invigorating, powerful and spicy. It is a warming ingredient that will perk up your senses and get your blood flowing. Ginger Ale from a can will not give you a true 'ginger buzz'. In fact, there are only a handful or truly respectful bottled 'ginger' beverages. Real fresh ginger is much more powerful than most products insinuate. To get a bold ginger buzz, the ginger must be fresh, raw, and in this case - juiced. And if you really want an over-the-top "Oh my goodness, that's spicy!" moment, you will have to juice a brave amount of ginger. How's your ginger-drinking prowess? Bonus Effects! Ginger is said to have anti-inflammatory properties and is well known for its tummy-soothing effects. Spicy Red Cayenne: sideline spicy ingredient. You can add a tiny pinch or a few bold dashes. dash it on top, or swirl it in. Either way, you'll get an extra flame of heat for mouth - and out through your sinuses...breath out through your nose as you drink to speed things up. Who Drinks Sinus Juice? I serve this juice to anyone with a cold, lazy immune system, stuffy nose or allergies. Congestion can sometimes be stimulated in such a way that your body naturally de-congests itself. No harsh pills needed. 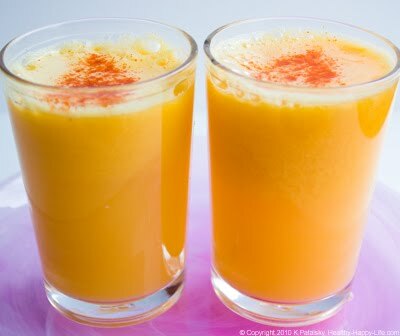 Super spicy soup, a spoonful of hot sauce, wasabi shots or my delicious choice for sinus clearing cravings: this juice. Give it a try and don't be afraid to add more ginger or cayenne if you're feeling brave! 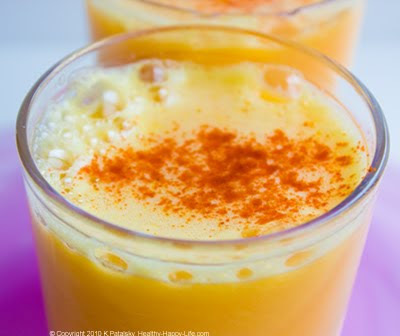 This super spicy citrus juice is great for an immunity boost! Ginger, cayenne and orange. Add all ingredients to a juicer. Add cayenne and/or salt over top the juice to serve. Alternative way: Juice the lemon and orange. Add everything to a blender - including the lemon and orange juice. Add 1/2 cup water. Blend from low to high until smooth. strain the juice or drink as is. Ice can also be blended in if you want a frostier texture. Spiciness Troubleshooting: If the juice is too strong, juice another apple or two and add the juice into the mix. If it is still too strong, try juicing in some celery or cucumber (if you have it on hand). This will cool down the ginger. But then again, this is super sinus juice, so hopefully you can brave the spicy sip. Note: You can also substitute the orange for grapefruit - if you'd like. Health Note: Always check with your doctor before overdoing it on any one ingredient. 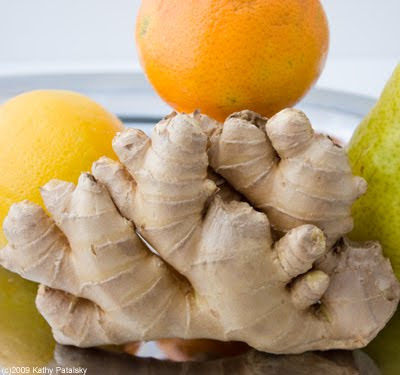 Ginger may even interact with certain medications. Just because it's natural, doesn't mean you shouldn't be careful!